Greetings from the Troy Alumnae Chapter of Delta Sigma Theta Sorority, Incorporated! Our Chapter has served the communities within the City of Troy, Pike County, Barbour County and Bullock County since 2004. We are excited to continue our service to this community through the Sorority's Five Point Programmatic Thrust: Economic Development, Educational Development, International Awareness and Involvement, Physical and Mental Health and Political Awareness and Involvement. For maximum community impact, our Chapter often partners with other organizations. Please contact me at president_troyalumnae@yahoo.com to discuss partnership opportunities. 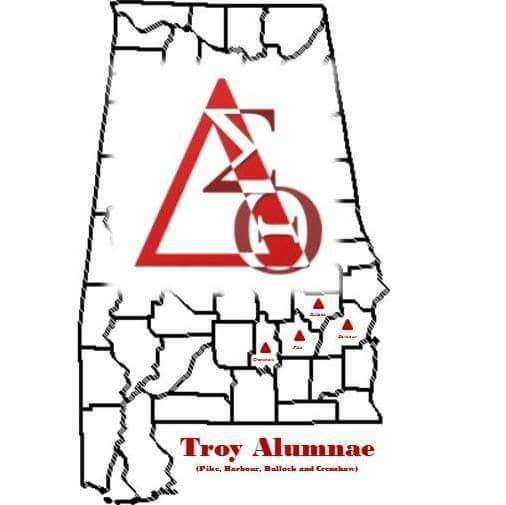 If you are a member of Delta Sigma Theta Sorority, Inc. and you wish to connect with our Chapter, please contact us at troydstalumnae@yahoo.com. Our meetings are held on the 2nd Saturday of the month at 10:00 a.m. at the First Baptist Missionary Church Annex in Troy, Alabama.